Serving Northern Los Angeles County and the cities of Palmdale and Lancaster, the Antelope Valley Transit Authority (AVTA) provides mobility and access to the residents of a region with a rich history of aerospace innovations that includes the Air Force Test Center and Edwards Air Force Base. The Antelope Valley is home to a robust manufacturing sector that features Northrup Grumman (building the F35, the worlds most advanced combat aircraft), General Atomics, Lockheed Martin and many others. Meeting the transportation needs of this dynamic and diverse region requires AVTA buses to travel more than 3 million miles per year, making the move to zero-emission buses not just important but absolutely necessary. By taking public transit, AVTA customers are choosing the most inexpensive mode of transport, doing their part to relieve congestion, and with our zero-emission buses, they are also helping create a healthier region for themselves and the community at large by eliminating thousands of tons of PM and GHG from diesel- and CNG-fueled buses. Eliminating exhaust by-products emitted by diesel and natural gas buses leads to a healthier environment on multiple fronts. It creates a healthy emission-free space for our customers and for the bus operators who no longer have to breathe recirculated exhaust, or deal with the clanking and vibration of an internal combustion engine. Maintenance technicians benefit from not having any exhaust fumes in the shop, no diesel fuel on their skin, no dirty harmful particulate residue from replacing and cleaning PM traps and no more caustic diesel emission fluid to handle, store and dispense. “I think we’re setting the standard for the entire country with electrifying the bus system in the Antelope Valley,” stated Assemblyman Tom Lackey. AVTA first embarked on the journey toward an all-electric zero emission bus fleet in 2015. 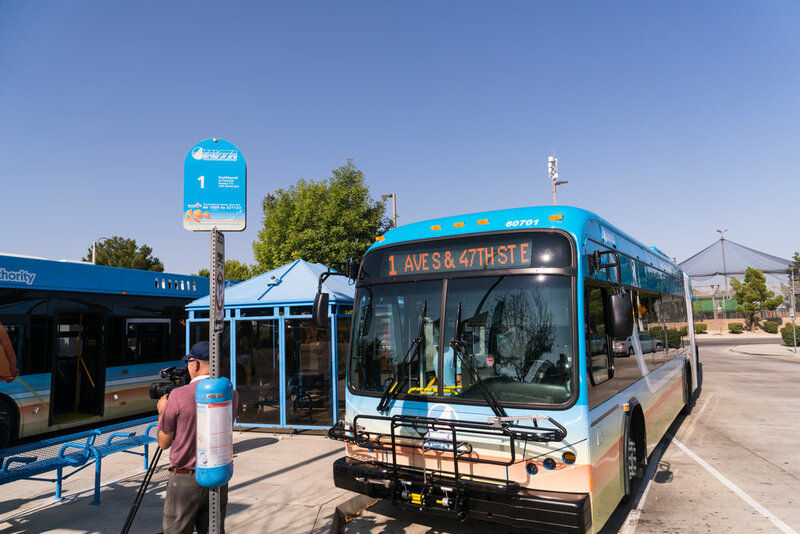 Thanks to funding awarded by the California State Transportation Agency in 2015, AVTA was able to purchase the first 29 of the 85 zero-emission battery-electric buses. AVTA was able to procure the world’s first 60-foot zero-emission battery-electric articulated bus, as well as the nation’s first battery-electric commuter coaches. With additional awards in 2016 and 2018, AVTA is making the entire fleet electric.